As the bullet strikes each target, the force spins the target and locks it in an upright position. In order to reset the system, simply shoot the reset target or each individual target and begin another round of practice or competition. 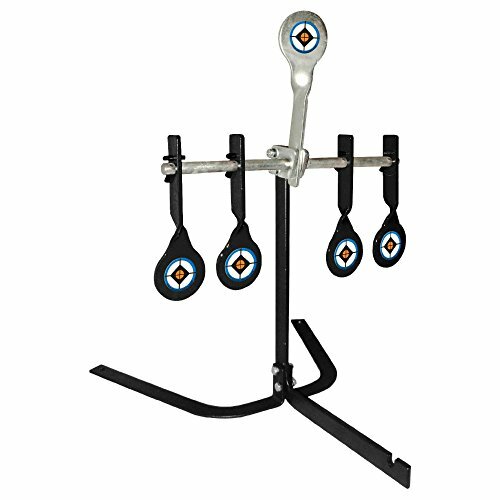 Dimensions of the set up is approximately 16 inches wide x 19 inches tall with each targets having a 2.5 inch diameter. HIGH VISIBILITY: The target has a high contrast target and a diameter of 2.5 inches, giving you a fair shot at hitting this high visibility target. RESET WITHOUT WALKING DOWN RANGE: The 4 side targets spin and lock in an upright position when hit. Simply shoot the center reset target or each individual target to send them back down and begin another round of practice or competition. INCREASED DEFLECTION SAFETY: This target is designed to be forward leaning to provide safer downward bullet deflection. It also includes ground spikes to help stabilize the target. STURDY CONSTRUCTION: Steel construction makes this a sturdy auto reset target. The set up measures approximately 16 inches wide x 19 inches tall.